The default Inca consumers described in Section 6.7 are created by fetching XML report data from the Inca depot and applying XSL and JSP to produce HTML tables and graphs. XML can be fetched for specific Inca suites (or stored queries), resources, series and time frames. A number of methods are available for fetching Inca XML: REST URLs, Inca Client APIs, and Web Services. The different types of XML returned from these methods are described in Section 7.1. Once custom XML is retrieved (see Section 7.2), addtional XSL can be created to display the results according to individual requirements or the XML can be consumed by custom JSPs or other code. Examples of XSL and JSPs are located in the webapps/inca/xsl and webapps/inca/jsp directories respectively. 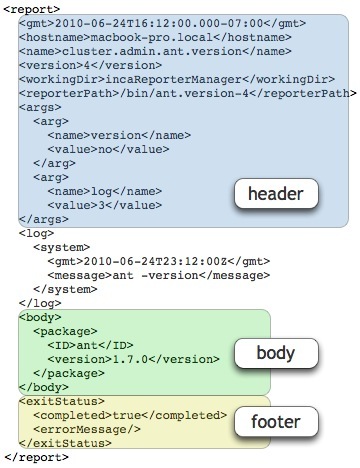 Below are some examples of the way XML can be transformed to produce the basic status pages. 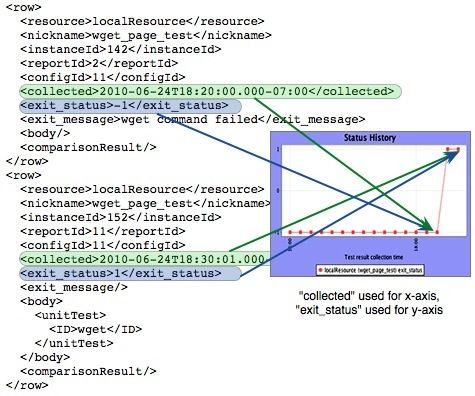 Figure 18 shows an example of XML that is transformed via XSL to produce a pass/fail table of test results. The XML is an array of report summaries, which are the result of querying for a suite or stored query. The exit status or body of each report summary is matched to a resource by the XSL to show the latest result for each resource. If the report summary has a comparison result, it will be used instead of the exit status to determine whether the test passed or failed. Comparison results are checks that are added before the report is stored - one example might be checking whether the software version found in the report was greater than a certain version number. 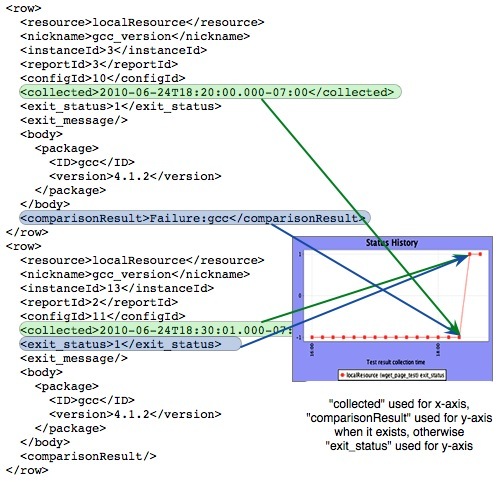 Another consumer example using report summaries XML is shown in Figure 19. Here the XML is transformed via XSL to produce a table of performance results. Like the pass/fail table, the XSL matches results and resources, but here XPath is used to display a statistic in the body instead of a pass/fail exit status. Simple pass/fail graphs are produced by transforming the graph instance XML as shown in Figure 20. The graph is produced by using the exit status values for the y-axis and the collected date values for the x-axis. The w3schools site offers an XSL tutorial and an XPath tutorial for more general information about XSL and XPath. Inca reporters are executable programs that measure some aspect of the system or installed software. Reporters support a set of command-line options and write XML reports to stdout. 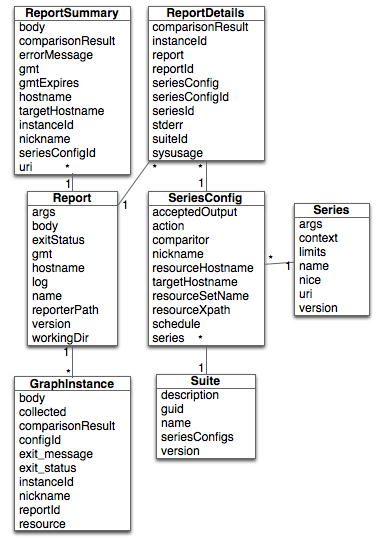 The report schema is flexible and can capture multiple types of data. When a comparitor is specified by an Inca administrator, an additional field, comparisonResult, is returned with the Inca data and contains either a 'Success' or 'Failure:reasons' value. The reason value will be the part of the comparitor that failed, e.g., gcc or bandwidthMB. If a report with an error is sent to the depot, the errorMessage will be set causing the comparitor to fail and an email notification to be sent. 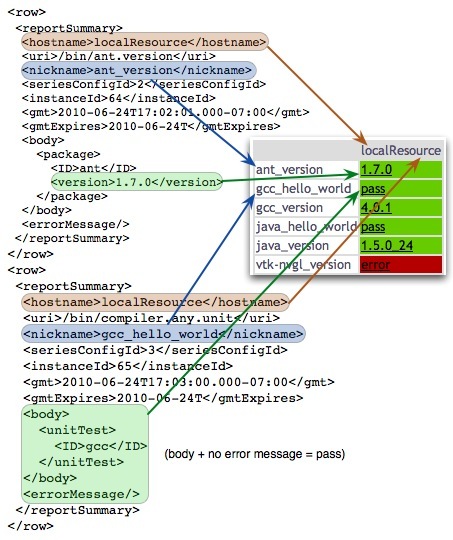 Below is an example of a series that gets a version of gcc. The series originally has a comparitor that requires a specific version of gcc (>=4.2). The series fails until the comparitor requirement is removed. Inca depot query results are formatted as XML, most are an array of reporter execution summary, graph or detail information. These results can be retrieved from the REST, JSP, Client and Web services interfaces described in Section 7.2. Report summaries use a prefix with a tag name that references the http://inca.sdsc.edu/queryResult/reportSummary_2.0 namespace. 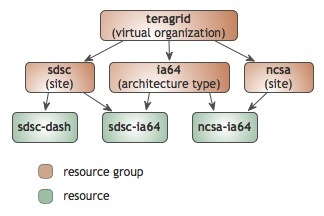 resource id of the resource group whose macros were used in configuring the report series. For example, if a reporter executes on resource A, but it uses macros from resource B to get a hostname parameter for the test, the resource id for resource B will be the targetHostname. 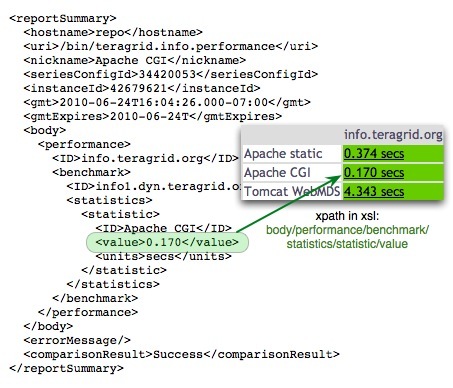 Graph instances use a prefix with a tag name that references the http://inca.sdsc.edu/dataModel/graphSeries_2.0 namespace. Report detail output is surrounded by <reportDetails> tags. A prefix with a tag name that references http://inca.sdsc.edu/dataModel/reportDetails_2.1, which is the namespace that defines the report schema, can also be used. Note the rest keyword may be vary by Inca deployment. Please check with your Inca administrator for a non-default keyword. Returns the latest results for the specified suite (or query) as an array of report summaries. Returns the latest results for the specified suite (or query) and resource or resource group as an array of report summaries. Returns the last week of historical results for the specified series as an array of graph instances. Returns the last month of historical results for the specified series as an array of graph instances. Returns the last quarter (3 months) of historical results for the specified series as an array of graph instances. Returns the last year of historical results for the specified series as an array of graph instances. To query the Inca data via an API interface, you can utilize the Inca Web Services API. Please check with your Inca administrator first to check that the Web Services component is installed as described in Section 9. Next either ask your Inca administrator for the WSDL file for their deployment or download it directly from the Inca releases directory here. Then find the Inca Web Services hostname and port from your Inca administrator and edit the following portion of the file. The following shows an example of how to access the Inca web services from Perl using the Perl module SOAP::Lite. When run against the default installation, the results should look similar to below. An alternate method of accessing Inca data is through the the Inca Agent and Depot Client APIs. You can use this method if the Inca deployment is setup without authentication or by acquiring a set of credentials from your Inca administrator. Currently, we provide Perl and Java client APIs to the Inca agent and depot. A number of the API functions return XML that can be used in custom Inca data consumers. For example, the DepotClient's queryInstance, queryLatest, and queryPeriod functions respectively return the report details, report summary, and graph instance XML document types described in Section 7.1. A summary of the available APIs and links to further documentation is shown in the below table. The Perl Client API can be accessed on the Inca server at $INCA_DIST/lib/perl or by downloading the incaws tar ball, Inca-WS.tar.gz. To install Inca-WS.tar.gz, perform the following steps. Install the module using the following command where $PREFIX indicates the desired destination directory. Copy the credentials from your Inca administrator over to the new installation. The file trusted.0 will actually be the hash of the CA certificate and will look something like 51b63f6c.0. Below is a sample of code using the Perl APIs that pings the Agent and queries for its configuration. Type in the password provided to you by your Inca administrator when prompted. You should see the output as above. The Java Client API can be accessed on the Inca server at $INCA_DIST/lib/inca-common.jar or by downloading the inca-common tar ball, inca-common-java-bin.tar.gz. To install inca-common-java-bin.tar.gz in a directory called $PREFIX, perform the following steps. Below is a sample of code using the Java APIs that pings the Agent and queries for its configuration.